I’m back! and with a bang! I have lots of posts to publish, so this blog will be on a roll! All segments are back, from Logos corner, get ready with me, outfit posts, recipes, reviews etc. 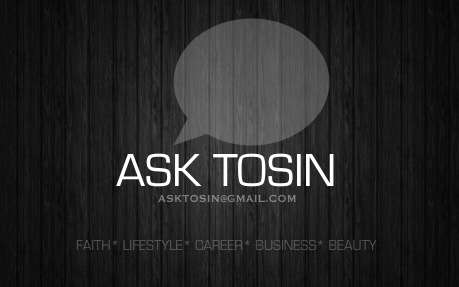 I’m also adding new segments to the blog, one of which is “Ask Tosin”. I get lots of mails weekly on various issues from clothing stores, to beauty, spirituality and even career. Hence I’ve decided to make it an official part of the blog. (You can mail me at asktosin@gmail.com I’d respond ASAP). However, if I feel some questions are repetitive or may be beneficial to many, I’d publish them as FAQ’s (frequently asked questions) But if you’d like to stay anonymous or confidential I would certainly respect your wish. I’m really excited about this time in my life , so much goodnews and activities which day by day I’d be unveiling to you all. Thank you again for the support. P.s. Don’t forget to share and add my blog to your bookmark to avoid typing my long blog name lol. Yes ma! bookmarked.. wide smile.